The cruise ship docked at 7:00 a.m. on August 5, 2010 in a beautiful seaport called Livorno. We boarded our motorcoach to visit the town of Pisa. As we walked to Miracle Square in Old Town, Pisa. We could see the massive cathedral and around the outside was the justifiably famous Leaning Tower of Pisa and the stunning Baptistery. Within this square, a lifetime would be spent. Baptised in the Baptistery as an infant. Attend church during a lifetime and a cemetery in the back of the cathedral for the faithful to be buried. 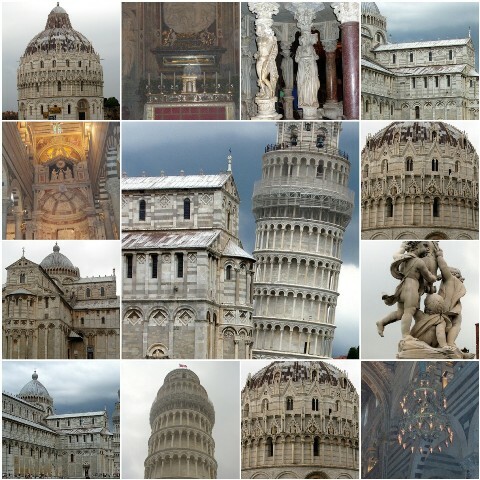 What a fabulous experience to see the Leaning Tower of Pisa up close and personal. I was in Awe. Wednesday's post is the last stop on our Mediterranean cruise to celebrate 50 years of Marriage. And, also thank you for visiting today. I am joining Mosaic Monday @ Little Red House. Link back for more Mosaics. Interesting photos Betty! Wish to go back to Italy soon. Congrats on your 50 yrs! What a fantastic way to mark the occasion, and a very terrific mosaic! Thank you for the beautiful geography lesson! Wow! Very nice photos...I can only begin to imagine the history in such a place! I am reading this again because I will visit there in September. I reread your profile that you married your high school sweetheart and your interests are photography, decorating, gardening and traveling. Believe me we have a lot in common. I share the same interests and married the guy I dated my senior year in high school. We have been married 42 years this August so I guess this will be an anniversary trip to Italy. We are flying to Rome and will join an Insight Tour called, The Best of Italy.